I thought it was a joke: Philip Pullman, young adult author and outspoken critic of organized religion, in a public discussion with, get this, the vicar in a church. So it’s okay to be organized in a church so long as the topic is writing. 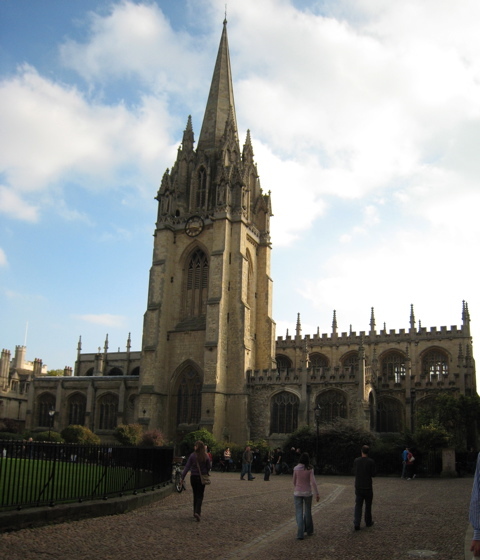 I grabbed my teenaged son, who loved His Dark Materials trilogy even more then Harry Potter, and joined throngs of Oxford students at The University Church of St. Mary the Virgin on October 22nd. What a dramatic setting: stained glass, vaulted ceilings and gargoyles dating back to the 13th century. 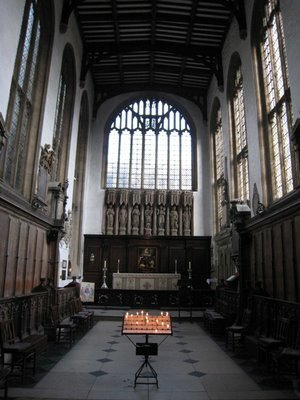 I half expected to find a daemon lurking in the pews. 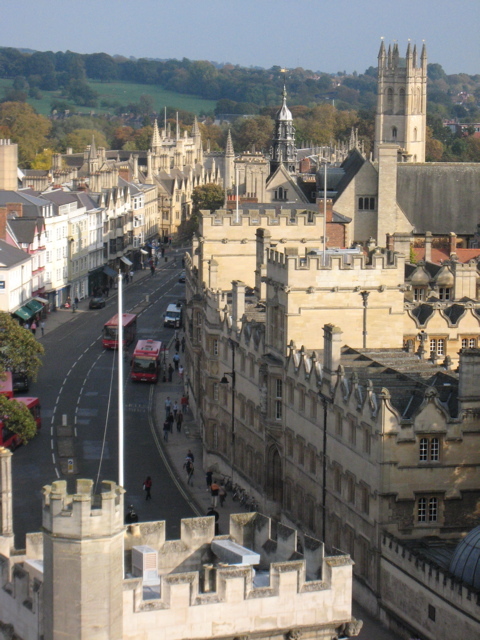 The fantasy series was set in his hometown of Oxford in this universe and in others. 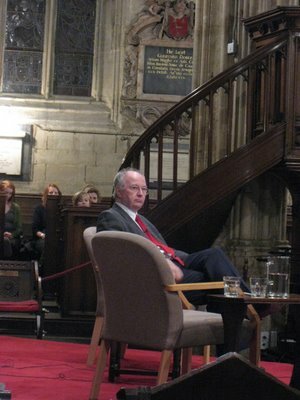 Philip Pullman fitted the collegiate venue. He looked and sounded more like a tenured college professor than a bestselling author and iconoclast. He was warm and friendly with his host, Canon Brian Mountford. 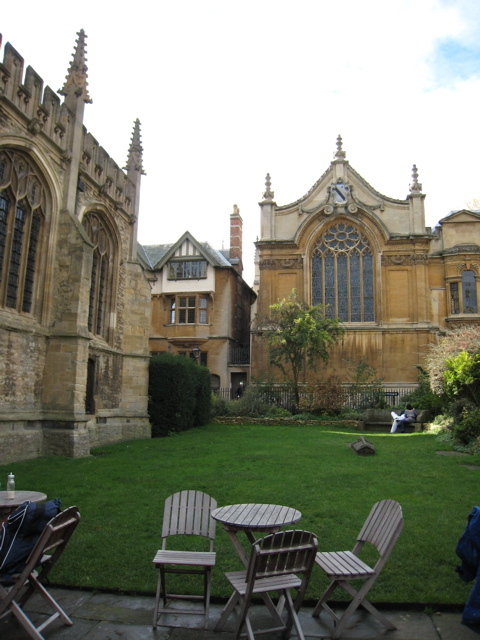 Pullman referred to himself as a “Church of England Atheist.” He praised the Bible for its beautiful prose and noted religion’s value in building community. Pullman’s quarrel is not so much with religion but that “the church abandoned people in my position.” He cited religious wars, persecution and intolerance. The Church of England was an important part of his personal history. He seemed to regard it more like an eccentric relative than the enemy. When Pullman was only seven, his father died. His grandfather, an ordained minister, partially raised him. Pullman praised his beloved grandfather for being a gifted storyteller. Later Pullman claimed that parents could do better by telling moral stories as opposed to religious ones. In a Hollywood minute, the conversation jumped from religion to the upcoming film version of His Dark Materials. When Mountfield asked if the adaptation was true to the book, Pullman replied that the film is but one in a long series of different ways of telling the same story. Since writing the novels, there have been abridged audio books, a radio dramatization and 2 stage plays. Each has a different emphasis that reflects the genre. His Dark Materials film will have special effects not possible on the page. It won’t be the same because the book takes eleven hours to read out loud, compared to a two-hour film. Pullman also wrote some special scenes just for the movie. Pullman claims that his best idea was having the daemons constantly changing form until their humans hit puberty. At heart, it is a young adult book dealing with this magical transformation from child to adult. Biggest laughs came when Pullman answered the question of what would be his daemon. “My daemon would be a scruffy bird that steals from his neighbors.” He elaborated on how his imaginative fiction is rooted in research. There is no doubt in my mind that his best character is the drunken, armored polar bear. Pullman created this creature and the dueling scene after reading an 1812 essay about fencing with a bear. His magic brings it to life. On the way out, we dropped a couple pounds in the church collection box. 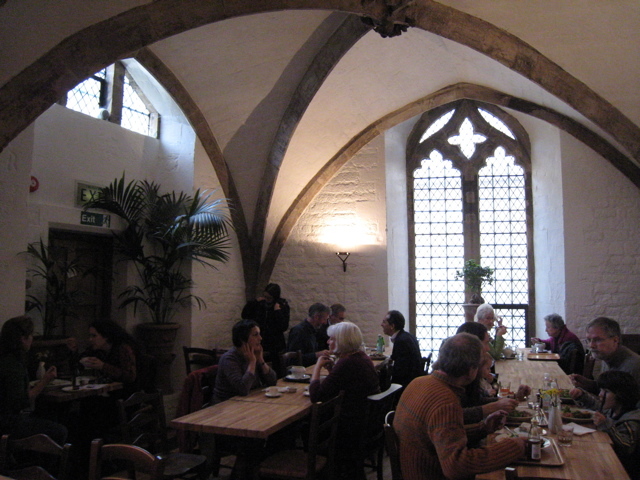 St. Mary’s also raises funds from visitors to the tower and by running a café called Vaults and Garden. The food is fresh and wholesome. Still, it’s hard to imagine any of this happening in an American church. That’s the fun of living abroad. A blog is the ultimate democracy of the readers. What’s your take on Philip Pullman’s mythology? I'm going to have to reread Pullman's trilogy while I'm here. I was wowed by it a few years ago, but I've forgotten the details. And now that I'm in Oxford, there's no excuse. I also loved his very clever "I Was a Rat." When I read his trilogy, I loved it first because it gave my then pre-teen daughter a really ripping yarn to read that featured a fabulous pre-teen heroine. By the time I finished the last book, I realized Pullman had written one of the most gripping anti-religion books ever. I had heard in the States that the 'head' of the C of E felt Pullman's books should be required reading for young adults, whereas the RC Church was opposed to his books. There is clearly a range of toleration among established churches. The Sabins are another American family living abroad but in Bogota, Columbia. You can click on their blue name to view their interesting blog. It's interesting (and impressive) to me that Philip Pullman is so democratic in how he lets his readers interpret and reinterpret his stories. Oddly, that reminds me of the debates in the Church of England about whether the Bible should be taken as word-for-word as "Gospel Truth" or whether it, too, is open for reinterpretion according to different people and different generations. (A debate lampooned by Not the Nine O'Clock News in the mockumentary skit: "The Devil: is He All Bad?" 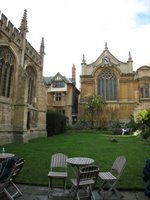 which featured a hip Anglican vicar explaining "These days, it's not so much, Get Thee Behind Me Satan" and more like "Come in me old mate, and have a cup of tea..."
I think Pullman's "mythology" gives his trilogy a resonance behind the story, but for me the real mythology is the story itself. 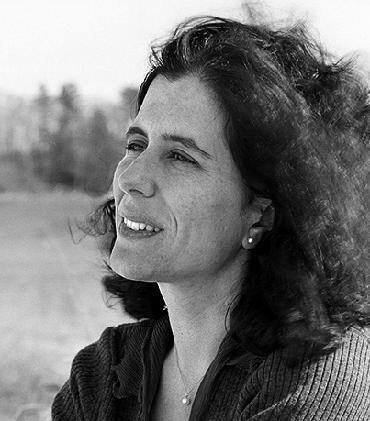 To my way of thinking, the role of fiction is to tell a story which, at best, gives the reader some insight into reality. I think 'Dark Materials' does that. Pullman's take on organised religion doesn't interest me as much. A book has to stand on its own merits. You may be looking at an old version of my blog if you entered through a keyword search or images. Click on that link to see my latest posting. All the old archives are there too. You can copy the link to your favorites/bookmark.